The accommodation is light, airy and very, very spacious. You will enter the property into a long hallway where there is a small cloakroom/toilet. The lounge is very large and open - comprising two comfy sofas, good quality (double) sofa bed, 65” flat screen smart TV on a unit, glass coffee table, feature fireplace with wall mirror above, glass coffee table and matching small lamp tables with lamps on; there are two mirrors on walls and windows have Roman blinds and curtains. The kitchen/diner has a large dining table with four chairs; built-in electric oven, range type gas hob with extractor over, washer dryer and dishwasher; free standing American style fridge freezer and also a microwave, kettle and toaster. 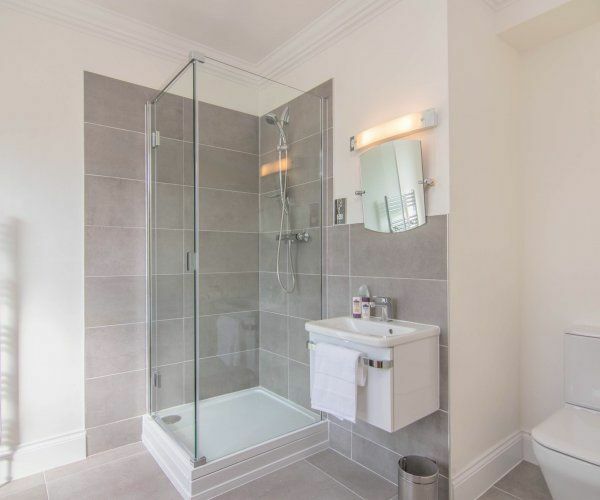 The two bedrooms are both large – the first very ample, with a king-size bed, large wardrobe, armchair and two bedside tables with lamps; the large en-suite bathroom comprises a bath and separate walk-in shower cubicle, basin and toilet. The second bedroom, also large, with again a king-size bed, wardrobe, armchair and two bedside tables with lamps; there is an en-suite with shower cubicle, basin and toilet. There is a lovely, enclosed and private, garden and patio area with brick built bbq – all for sole use of residents only. The accommodation also provides complimentary free WiFi and off road parking.